Winter is a time for planning -- planning home improvements -- inside and outside. The Cookeville Home and Garden Show provides ideas and how-to information to help in that planning. Putnam County Master Gardeners will present two programs designed to help put these plans into action. The program starting at 12:30 will be Home Beautification with Container Plantings. Master Gardeners will present principles and possibilities of growing plants in containers. 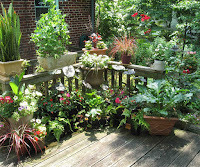 People are attracted to “container gardening” for many reasons. Some live in apartments, have small lots with little to no space for conventional gardens, renters do not want to invest effort that stays with the property when they move, and home owners find a vast variety of uses. Therefore, PCMG will have an informative assemblage of container demonstrations. Containers can be put anywhere and moved about as your mood changes. If something does not look quite right, you can take it away, spruce it up, and bring it back. Among the topics will be: Container Selections, Soil Choices, Plant Arrangements, and Care. Demonstrations of techniques and open discussion will be part of the presentation. Starting Garden Plants from Seed in Your House will begin at 2:30 with a presentation on the biology of seed and early life of several flowers and vegetables common in-home gardens in the Upper Cumberland. Success criteria of soil mixes, planting depths, temperature, light, watering, and transplanting will be discussed. The presentation will be accompanied by demonstrations and those in attendance will be given the opportunity to plant some seeds to take home. These ideas may help attendees expand their planning, increase versatility, and save money. The Home Builders Association and Master Gardeners realize these programs are introductions and the participants may need further information. Thus, Master Gardeners will answer any inquires made by contacting the University of Tennessee Extension Service (931-526-4561).